The park occupies 7.5 acres owned by the Washington State Department of Transportation that was identified as potential open space in the 1998 Eastlake Neighborhood Plan. 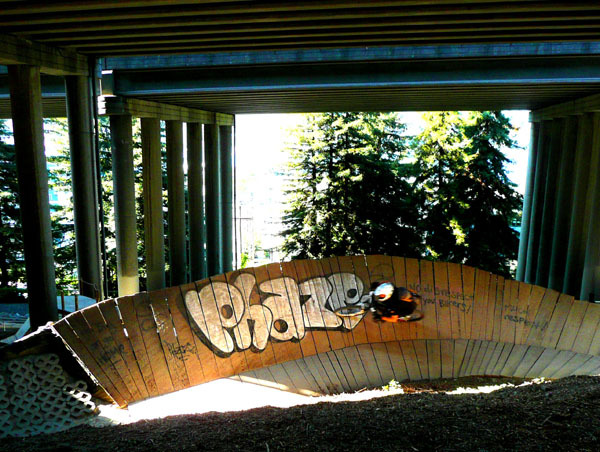 The 2000 Seattle Parks Levy tossed in $1.8 million for construction, and the Backcountry Bicycle Trails Club stepped up with thousands of hours of volunteer work to build the mountain bike trails. More details on the history here. The photo above shows the scene yesterday, at the grand opening celebration of the complete park (parts of the park have been open since 2005). It’s a startlingly vast area under there. 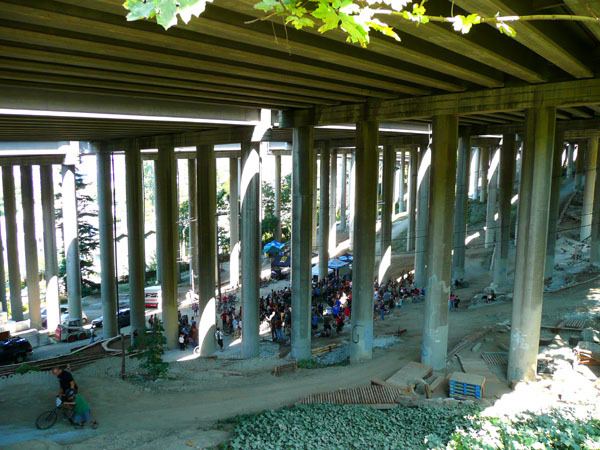 The looming I-5 deck, the massive, towering concrete columns, the dusty dry ground, and the slashes of sunlight create a uniquely surreal atmosphere. And there must have been about a billion dollars worth of bicycle in the park yesterday (what recession? — a $2k dual-suspension dirt jumper in every pot!). It’s inspiring: citizen volunteers, the neighborhoods, the City, and the State all playing nice together to produce something very outside the box that has become a smashing success. And not just for bikers: the new stairway through the park provides a new pedestrian connection across I-5, and it has been well used. At yesterday’s event a petition was being circulated to request that WSDOT open a gated maintenance road that would allow a trail connection from the park to points south. 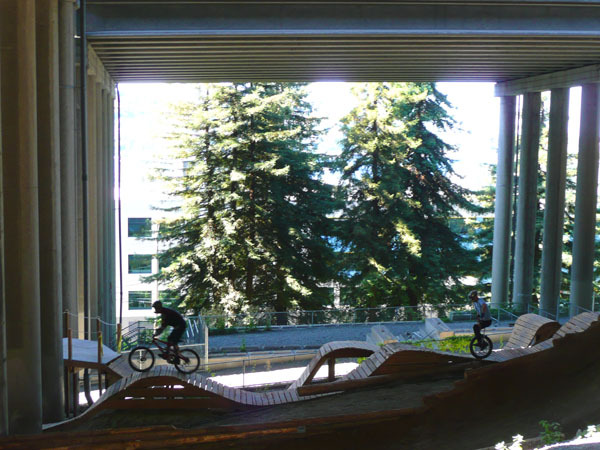 With Colonnade Park as a precedent, it will be much harder for WSDOT to say no. Posted by dan bertolet on	Sunday, September 14th, 2008 at 9:22 pm. You can follow any responses to this entry through the RSS 2.0 feed. You can leave a response, or trackback from your own site. It’s beautiful things like this that should make everyone here support the new Pro-Parks Levy coming up for a ballot vote.